Ok, first off, I love this hat. You can’t *quite* tell in this picture, but it’s a small hat, made for a lady. 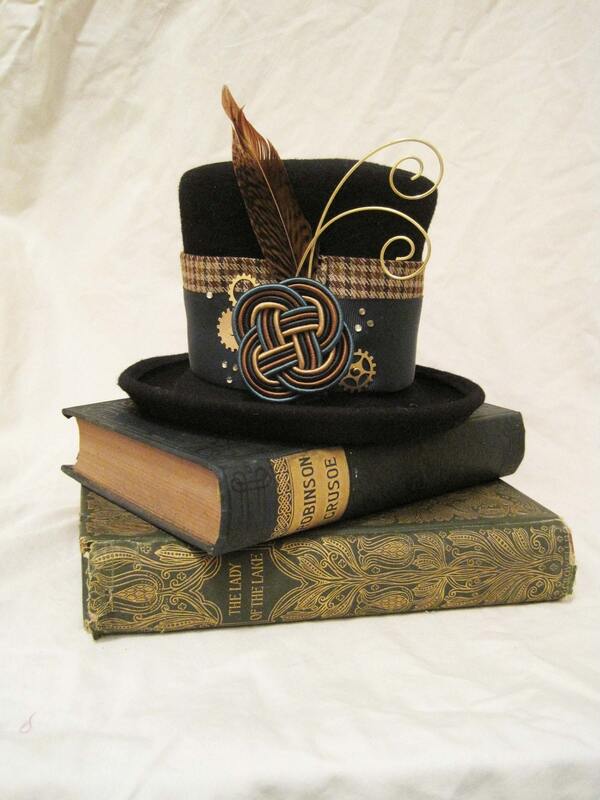 I love the colors of the knotwork, and of course the knotwork itself. The cogs are subtle and balanced and the feathers and curlicues aren’t huge and overbearing, giving the knotwork the attention it deserves. Secondly, I love this picture. There are several things I struggle with when I post my works to Etsy (which, if you follow the link, is where this hat is currently for sale.) and one of them is picture quality. This picture is fantastic, it’s interesting, it’s clear and in focus, and it highlights the ‘mood’ of the object. Lastly, This hat makes me dream of the dress that would match it. What ensemble would fit this hat? The colors would be breath taking. I have an idea in my head formulating perhaps I shall draw it up and post it in another post. Underbust corset with shoulder straps over a plaid chemise and a blue and gold overskirt. Ooooo, the ideas it gives me…and after all, this blog is all about stimulating and showcasing ideas! It is absolutely fascinating. You can chose to be male or female. The game then gives you five social opportunities where you have to chose what to wear, and how to behave in order to be socially acceptable in Victorian Society. Try it! Let me know how you do in the comments below!